Don’t let the feminine title fool you; CrossFit’s lady-named workouts are notoriously nasty. You actually might have heard of a routine like this one in the bodybuilding universe. Arnold Schwarzenegger had a tendency to superset chest and back a lot, and these two exercises were his favorites. If you need to use light weight for the bench and an assistant for pull-ups, that’s fine. Just choose a version of the exercise that’s challenging, but still allows you to get a lot of reps.
Now, you might look at this workout and think, “What’s the big deal? 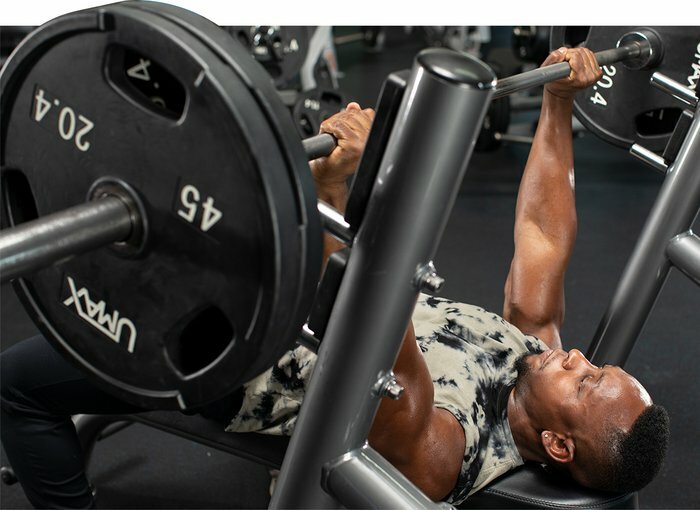 It’s only one superset.” What makes these workouts challenging is that you’re chasing either max reps or a faster time—or in this case both. You start the clock when you start your first rep, and don’t hit the stop button until you finish all 5 rounds. Every second you take to catch your breath or grab water counts toward your time, so if you’re competitive—and I know you are—you’re going to want to waste as little time as possible. If you absolutely must take a few breaths between rounds, go for it! You’re not trying to pass out. Just don’t take too much time, because you’re up against the clock. That’s where this workout will feel different from a normal bodybuilding split. You won’t have the luxury of resting for a few minutes between sets, so your muscles won’t have time to fully recover. You’re going to notice the difference and feel the burn, but it’s that ability to push through and keep going without rest that will lead to bigger gains down the road. If you’re looking to add more volume, use this WOD as a kickoff to an intense chest and back session, or keep it in your arsenal of quick, muscle-building workouts when you’re low on time.